What a weekend! 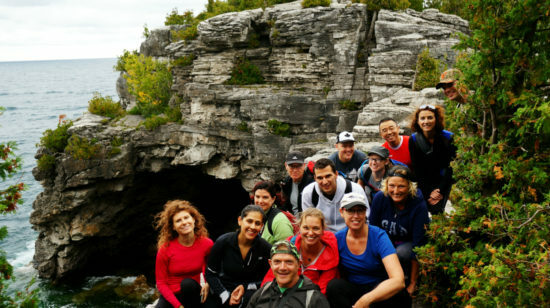 We just wrapped up another StrengthBox Tobermory retreat with a 28km hike. 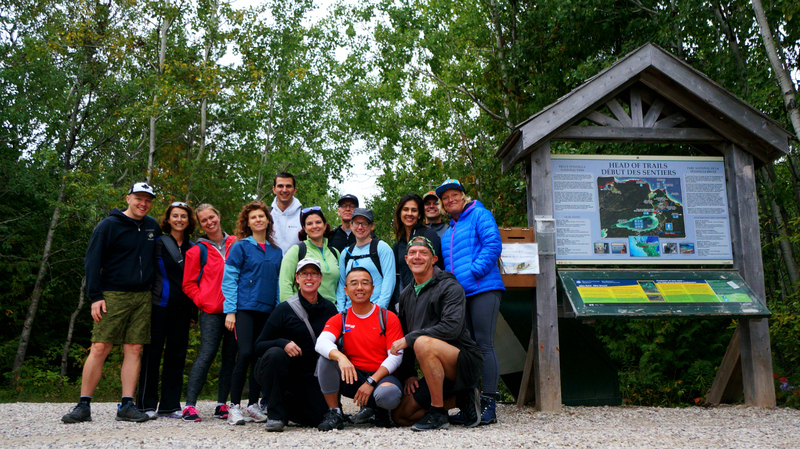 14 people joined us for this active travel adventure — and what a team it was! With such camaraderie, it didn’t take long for a few participants to create a new hashtag #fitnessanddebauchery for social media posts. Fitness and debauchery? Well, we do take our fitness seriously. But we also like to have fun, and believe strongly that life should feel good. Now, perhaps “debauchery” is a bit of a strong word to describe some of the other elements of StrengthBox retreats (although we certainly have our mischievous moments). Having a glass of wine or two isn’t exactly debauchery. OK, well there was the toga party in room 210. But other than that, we were mostly business. The Kritikos family, who own and operate the Tobermory Princess Hotel, were beyond hospitable as usual. The meals weren’t only healthy — they were delish! From locally-caught Georgian Bay whitefish to baked aubergine-tomato stew with Greek olive oil, the dishes were as home-cooked as you could get. 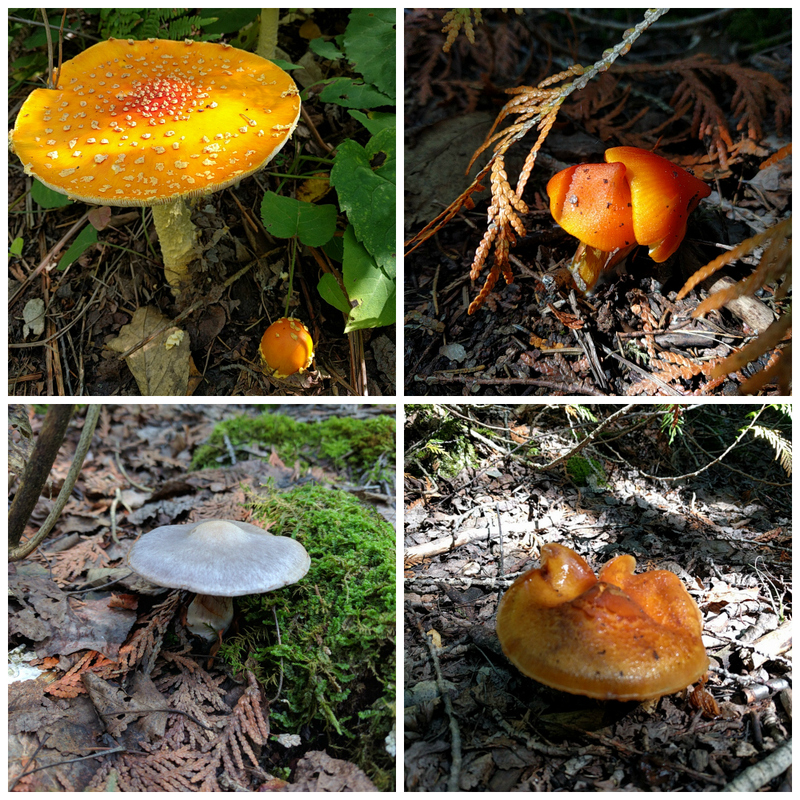 The feature of the weekend was a mammoth hike from Cypress Lake to Tobermory on the Northern Bruce Peninsula, a one-way trip of over 28 kilometers. Starting at Cypress, we walked around scenic Horse Lake to the shoreline of Georgian Bay where we picked up the famous Bruce Trail at Indian Head Cove. From there, the walk become a rugged hike — challenging, but with delightful rewards of spectacular views. 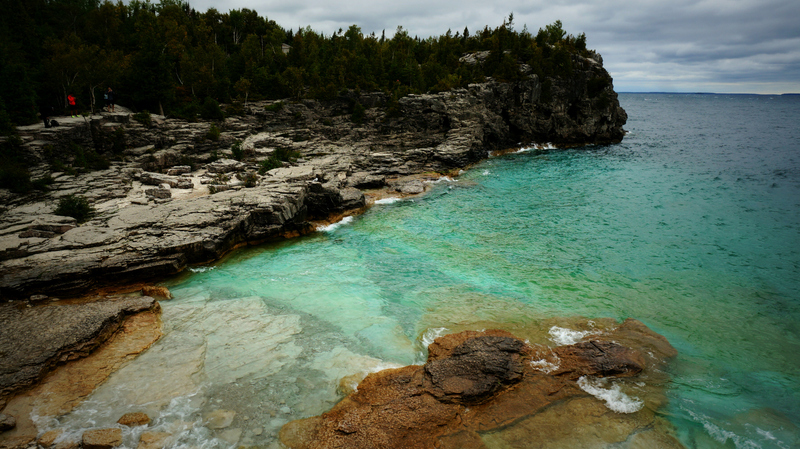 Few hikes anywhere rival the scenery found on this remote stretch of the Bruce Peninsula that runs along the waters of Lake Huron and Georgian Bay. With strange and wonderful rock formations, cliffs, mysterious sea caves, clear turquoise waters and stretches of wild rocky beaches — it was almost perfect. 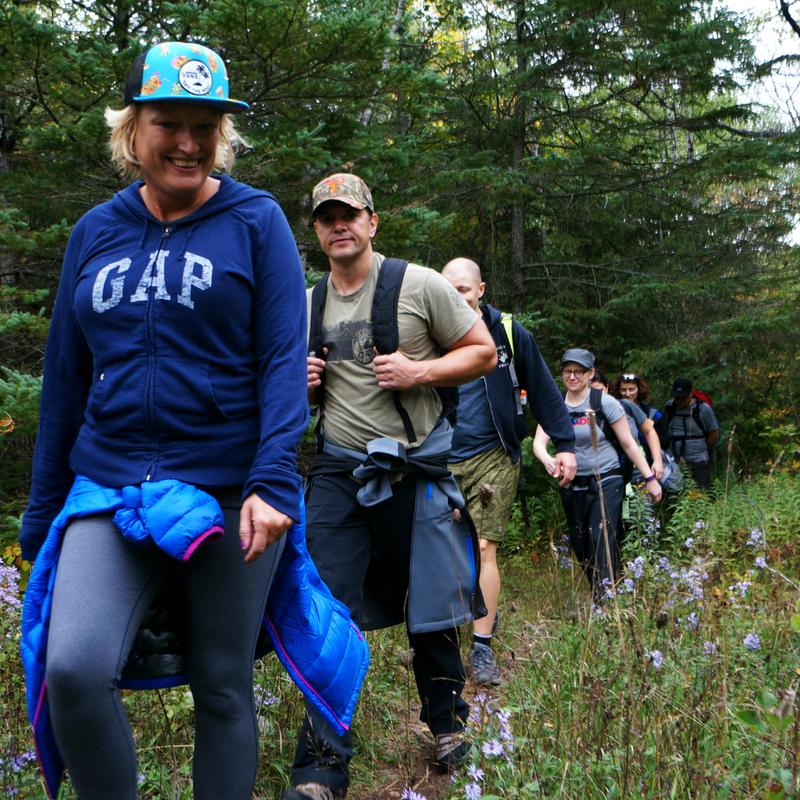 While this stretch of the Bruce Trail is considered the most difficult, it was varied enough to give us ample stretches of easier terrain that allowed us to recover. Moss-covered forest floor, compacted soil, farm fields, stretches of dirt road and even a golf course mixed with rockier terrains that required some serious scrambling. Our hike took us just over eight hours to complete (and at the end, there was a 65 foot lookout tower that demanded another 112 steps to climb)! After such a journey, we allowed ourselves to indulge a bit, but the wine was well-earned. After dinner, we enjoyed a vintage dessert wine from the Greek island of Santorini. Made from sweet sun-ripened grapes, it was full bodied, well balanced and quite excellent. 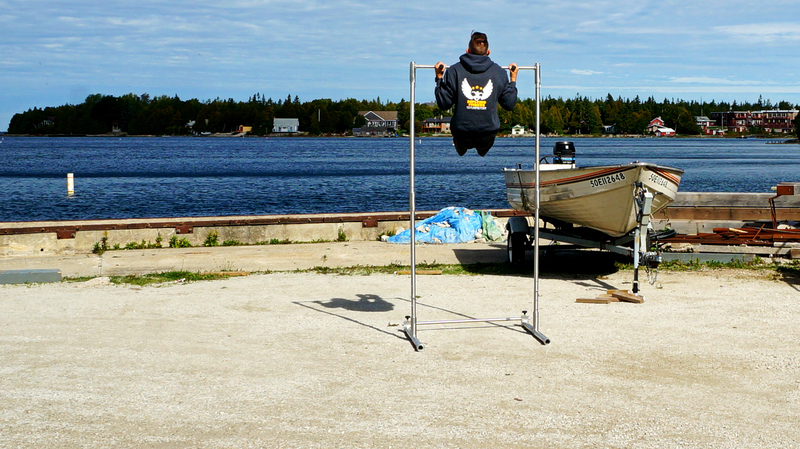 Sunday found us doing an outdoor workout next to Little Tub Harbour. We did some good joint mobility, a few stretches to soothe our aching leg muscles, and then settled into a good upper body training session. 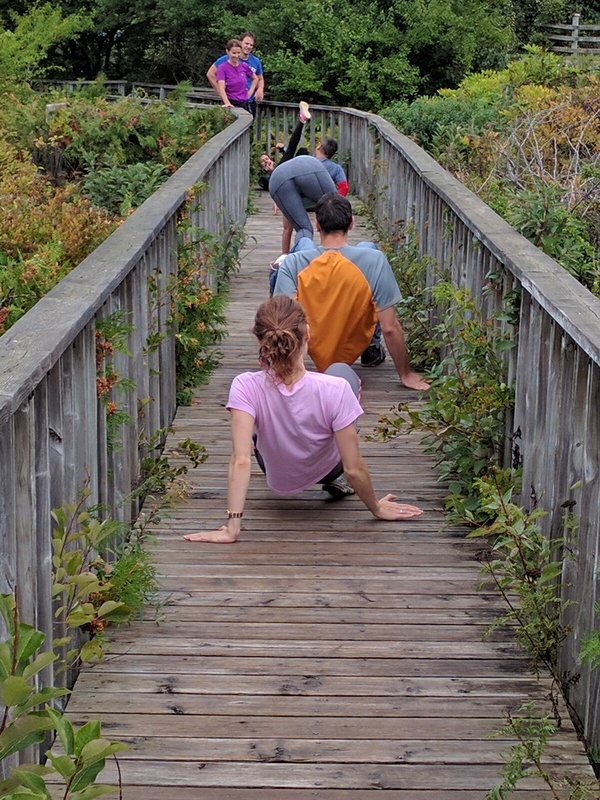 Basic pulling and pushing exercises were combined with some specific skills that gave everyone a good workout. Finishing the session with an elbow plank hold, Evelynne and Greg managed to hit the 5-minute mark (although Greg seemed a bit shaky towards the end!). Whether it’s #fitnessanddebauchery or #musclesandmayhem, you’ll have to be sure to check out an upcoming retreat. They’re always an adventure, and really just tons of fun!